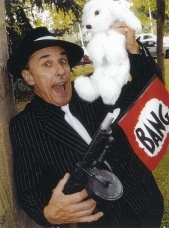 This act is definitely "a cut above the rest" and now you have it in black and white but definitely not blue! There is the balloon of death, ropes that will tie you in knots plus the story of the American "Bandana". Interspersed with the above are plenty of gags to keep all nationalities happy plus the spectator who will attempt an "underwater escape" and a blood churning "sawing a woman in half" illusion with a very real Black and Decker electric saw! 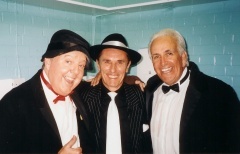 This is the act that Mel performed on a recent theatre tour of "The Funny Guys" with Don Mclean and Jimmy Cricket and was included in the "Vince Hill Show" and an "All Star Variety Show" with Bert Weedon and Sid Little.